The aftermath of Odile left 26,000 tourists stranded in Baja California, away from their homes, and with no communication means. 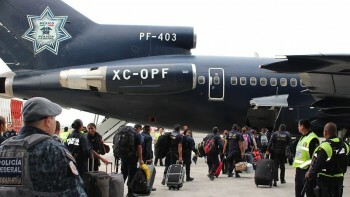 But in a remarkable operation, the Mexican Government, the military and the private sector coordinated an “air bridge” that would move 18,000 tourist out of the affected region in three days. By Thursday, Mexico’s Transportation Ministry declared that 18,000 people had already been flown out on more than 120 flights. Americans, Europeans, and others were flown to major cities such as Guadalajara, Toluca, Mexico City and Los Mochas. American passengers arriving at Tijuana were swiftly taken to San Diego. Odile hit Baja California on Sunday, causing major damage to the International San Jose Los Cabos Airport. By Tuesday, tens of military and commercial airplanes were flying out of the runway to lead tourists to safety. Aeroméxico, Volaris and other Mexican airlines, were quick to react to the emergency, establishing hotlines, offering free trips to those in need and honoring fares for clients who had previously purchased their tickets. By Thursday, Mexico’s Transportation Ministry declared that 18,000 people had already been flown out on more than 120 flights. “Rescue efforts will continue until every tourist is taken out of the region”, pledged the Ministry of Foreign Relations. Though the situation is not easy, and Mexico is still faced with many challenges, the efforts to tend to the Tourist sector must be acknowledged. We at the Baja Real Estate Group wish to make our best effort to aid the local Baja California population. Tens of thousands Mexican nationals that live and work in Cabo are without basic electricity and water, and in desperate need of basic products, shelter and food.